As for your item 584134, this may well be the first mention of Ruth in a newspaper. The earliest I can come up with is April 6, a week after this. But I didn’t have access to Baltimore papers, so there may be something earlier there. “The Highlanders, soon known as the Yankees, had a middling record, while the nearby Giants were usually at or near the top of their league. So when the Polo Grounds burned in 1911, the Yankees used a certain calculating humility in letting the Giants temporarily use their own park. At the same time the Yankees said that they were building a new stadium at 225th and Broadway. 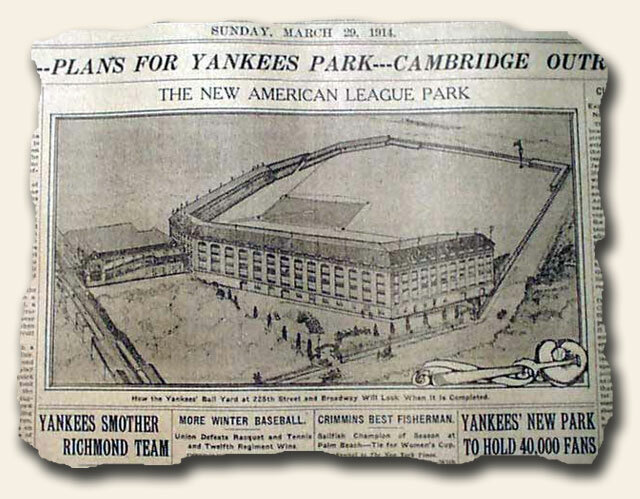 That project slowed, perhaps for money reasons, and in 1913 the Yankees temporarily moved to the rebuilt Polo Grounds where, for rent of $55,000 a year, they rubbed schedules with the Giants. What happened to this Yankee stadium? A question for all the Yankee fans out there: what happened to this stadium? 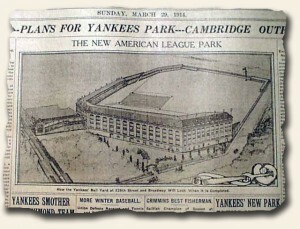 The March 29, 1914 issue of the “New York Times” shows the “…Plans For Yankees Park…” with a detailed drawing captioned: “How the Yankees’ Ball Yard at 225th Street and Broadway Will Look When it is Completed.” and beneath which is a detailed article headed: “Yankees’ New Park To Hold 40,000 Fans” “Double-Deck Grand Stand of Steel and Concrete to be Completed in September“. 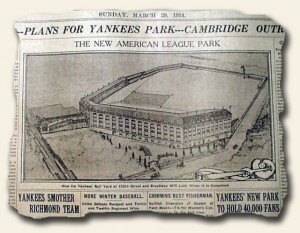 The article (see photos) provides many details of the new ball park, however I can find no record of it being built. The Yankee website notes that the team shared the Polo Grounds with the Giants from 1913 through the early 1920’s until the stadium called the “House that Ruth Built” was ready for use in 1923. Does anyone know the history of this “mystery stadium” supposedly built in 1914? It is so hard to believe that I am now traveling into the journals for December already. I found The Christian Science Monitor of December 2, 1910 to be very interesting, but I’ll highlight only two articles. The front page reports the sailing of the first vessel up the Panama Canal. This was a three-masted steam 17-foot yacht, Visitor II, owned by Commodore W. Harry Brown of Pittsburgh, which sailed to the Gatun lock and returned. The other article is found on the sports page, “Soon to Sign Contracts for New N.Y. Stadium”. This was to be a $500,000 stadium which President Frank J. Farrell of the New York Americans plans to build at Kingsbridge. 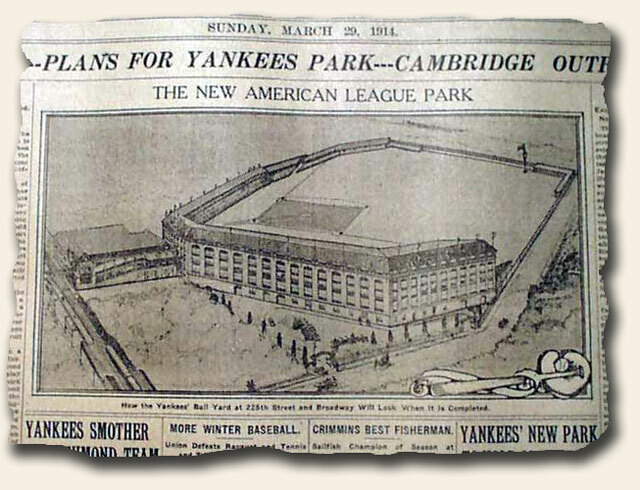 After doing quite a bit of internet researching, it isn’t quite certain if this may have been a stadium that existed prior to the earlier Yankee Stadium or not. It is noted that Mr. Farrell and William S. Devery were the first owners of the New York Highlanders, now the New York Yankees.